Mr. Levandowski is a retired computer executive and an aspiring rock and roll drummer in Napa, California. The client had recently converted his garage into a music studio for practicing his drumming and accommodating jam sessions with his garage band. The interior walls and a ceiling were constructed using 2-ply Quiet Rock to produce a “room within a room”. The resulting space was a relatively small 12’ x 14’ x 9’. The room included a two tiered ceiling height and a 4’ door cut at 45 degrees across one of the room’s corners. 1/4” thick carpet squares were used to cover the concrete floor. Whereas the room was virtually soundproof, the musical quality could be described as “heavily reverberant” with bass instruments sounding “muddy”. 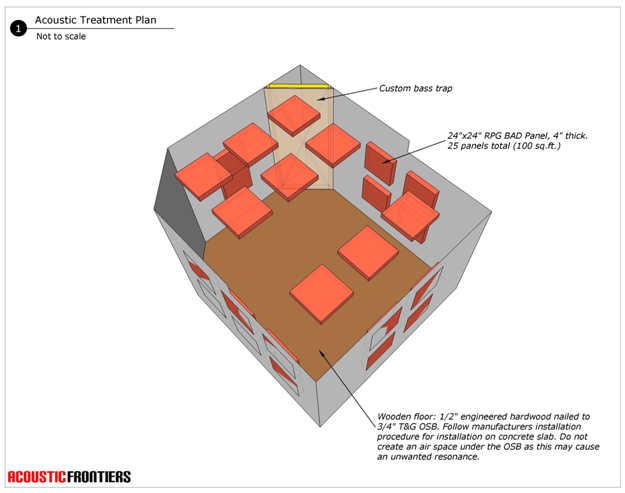 On realizing his band practice space had severe issues, the client approached Acoustic Frontiers to help! The client’s room before we worked our magic! 1. Replace carpet tiles with 1/2” engineered hardwood flooring nailed to 3/4” T&G OSB. This flooring scheme better balances the mid and high frequency decay time in the room compared to carpet tiles which only absorb the highest frequencies. 2. Add 25 RPG BAD 24” x 24” x 4” panels placed in specific locations on the walls and ceiling to control mid and high frequency decay time, reflections and flutter echo. The panel configuration will result in “full bandwidth” absorption down to around 100Hz and brings the reverberation time to a targeted 0.4s. 3D CAD model showing acoustic panel placement. 3. Add a floor-to-ceiling custom “bass trap” in one corner. The bass trap was designed as a widely tuned Helmoltz resonator with the design goals to provide absorption from 50-300Hz with most absorption in the range of the main axial room mode resonances (45Hz and 85Hz). Absorption tapers off above 300Hz to prevent over absorption of high frequencies. 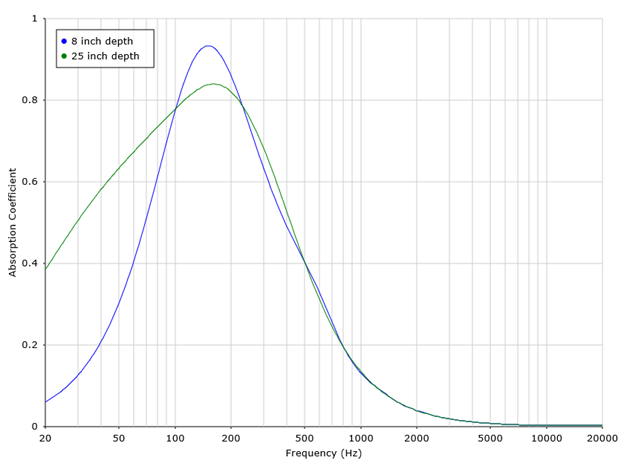 Predicted absorption of the custom designed, widely tuned Helmholtz resonator. The trap was mounted across a room corner and so has varying depth. A panoramic view of the remodeled practice studio showing the custom screen printed acoustic panel on the far left. View towards the drum kit showing the wall / ceiling BAD panels. “In September 2014 my wife agreed to let me convert 2/3rds of our garage into a studio that I could use to practice my drumming and get together with my garage band and play loud rock and roll music. I read a few DIY articles and proceeded to work with a local contractor to build a soundproof room within a room. We did a great job with the walls and ceiling by using special acoustical drywall and insulation. I used 1/4” carpet squares on the concrete floor. I was pretty happy with how the construction turned out. Unfortunately, when I started to use it to play, the acoustics were terrible. The sound reverberated like crazy and the heavy bass drumming and bass guitar resulted in a muddy, unintelligible sound. Needless to say I was disappointed. I tried hanging heavy blankets on the walls, but this was not only ineffective, it was ugly. I decided to seek out an acoustician to advise me on how to remedy the situation. I did an internet search and came up with a couple of candidates. Nyal from Acoustic Frontiers was quick to respond and dive into the background of my problem. He presented a proposal that was both pragmatic and convincing. His approach was to analyze the specifications and usage characteristics of my room and to model the sound signature. From the results he documented in the “Room Acoustic Analysis Report”, we discussed approaches on how to best mitigate the problems. We talked about trade-offs of space utilization, cost, performance, and aesthetics. We eventually agreed on an approach that included a balance of using made-to-order RPG acoustic panels with a custom made bass trap and new floor. The implementation phase of the project was executed smoothly and effectively. Nyal was readily available to respond to my technical questions and to interface with the acoustic panel manufacturer. My contractor had sufficient specifications on how to build the custom designed bass trap and install the new wooden flooring and acoustic panels. I am pleased with the acoustical outcome. The reverb problem no longer exists and the quality of the sound is excellent. You can hear the distinct sound of all of the instruments and music sounds great even at louder volumes. I am also pleased at how the “look” of the room turned out. I was able to customize the color scheme of the fabric coverings on the panels and the hardwood flooring looks great.